It took a while for Victoria to catch up with Australia’s wind power capital, South Australia when it comes to the roll-out of giant fans. Now, just like SA – the cost of doing so is hitting home – or rather tens of thousands of Victorian homes – with a vengeance. One “hey, quick look over there” furphy, used by the wind industry to distract attention for wind power’s responsibility for a rampaging (and perfectly avoidable) social and economic disaster, is that escalating retail power prices are all about rising network costs: the “poles and wires” argument. As usual, the wind industry’s “case” falls just a little flat when the light gets shone on the actual facts. A study by Oakley Greenwood, “Causes of residential electricity bill changes in Victoria, 1995 to 2013” (available here) tells a somewhat different story than that pitched by the wind industry and its spruikers. .. [T]he annual bill of the average Victorian residential electricity consumer on a single rate tariff using 4,000 kWh per year has increased by $442 from 1995 to 2013 – an increase of 44.2%. However, the different components of the bill have not changed at the same rate over that timeframe. Since 1995, network-related costs in total – including the cost of the Victorian Government’s smart meter program and solar feed-in tariff – have increased by only 3.0% – an increase of just $15 over those years. The non-network related components of the bill – the cost incurred by retailers in purchasing electricity from the wholesale market for use by residential customers and maintaining customers’ accounts, plus the costs of policy initiatives that affect the wholesale and retail portion of the bill – increased by $295 (58.4%) over the period. Although the cost of all network-related services increased by $15 over the 1995 – 2013 period, the cost of ‘standard’ network-related services actually declined by $122 in real dollar terms over the period, a reduction of 24.7%. This reduction was almost fully offset, however, by the introduction of two initiatives by the Victorian government: (a) the mandated roll-out of smart meters, which included the cost of purchasing and installing the meters, and the communications and IT infrastructure required for their operation, and (b) Premium Feed-In Tariff, which provides incentives to households whose small-scale solar PV systems feed electricity back into the grid. The costs of both of those programs were recovered through charges that affected the network portion of consumers’ bills. These programs have added $137 in costs to the annual bill of the average residential customer by 2013. In terms of their contribution to the total bill of the average Victorian residential electricity user, network-related costs – including the costs of policies that are included in the network portion of the bill – have decreased over the 1995 – 2013 period, from 49.5% to 35.4% of the bill. However, if the costs associated with government policy-related programs are removed, the cost of ‘standard’ network services can be seen to have actually dropped from 49.5% of the bill in 1995 to 25.9% in 2013. The cost of (a) the wholesale electricity purchased by the retailer for the average residential customer, (b) the other operating costs incurred by the retailer in serving the customer, and (c) the costs of policy initiatives charged through the retail portion of the bill increased by $295 in real dollar terms between 1995 and 2013. So, that puts the “poles and wires defence” to bed. Let’s have a look at what’s really going on, and no better place to start than with a comparison to South Australia. South Australia suffers the highest retail power prices in the world (see page 11 of this paper: FINAL-INTERNATIONAL-PRICE-COMPARISON-FOR-PUBLIC-RELEASE-19-MARCH-2012 – the figures are from 2011 and SA has seen prices jump since then). 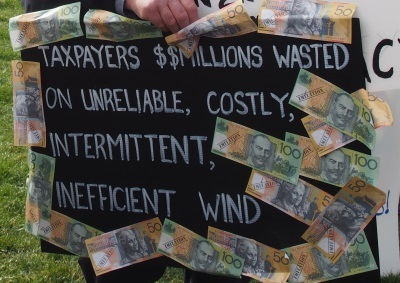 In SA (and Victoria), it’s all about the impact on retail power prices from having wind power outfits receive guaranteed rates from retailers which are 3-4 times the cost of conventional generation. In South Australia – with 1,477MW – has a little under half of the wind power capacity connected to the Eastern Grid: on those (rare) occasions when it’s producing anything like its capacity, retailers pay through the nose for it – and slug their retail customers accordingly; with its increased wind power capacity now hitting 1,220 MW, what follows applies equally to Victoria. Retail prices are impacted by the mandatory Large-Scale Renewable Energy Target (LRET) and wind power in at least three major ways. The first is the underlying cost of the Renewable Energy Certificates (RECs) issued to wind power outfits and purchased by electricity retailers. Retailer purchase RECs for one reason, and one reason only: to avoid the imposition of the “shortfall charge” – a federal government “stealth tax” that will add $30 billion to Australian power bills from here on (see our post here). It’s power consumers that get lumped with the “retail price of electricity” and, therefore, the cost of the REC Subsidy paid to wind power outfits. The REC Tax/Subsidy has already added $9 billion to Australian power bills, so far. The second is the price fixed under Power Purchase Agreements (PPAs) struck between wind power generators and retailers. That price guarantees a return to the generator of between $90 to $120 per MWh for every MW delivered to the grid. In a 2014 company report, AGL (in its capacity as a wind power retailer) complains about the fact that it is bound to pay $112 per MWh under PPAs with wind power generators: these PPAs run for at least 15 years and many run for 25 years. Wind power generators can and do (happily) dispatch power to the grid at prices approaching zero – when the wind is blowing and wind power output is high; at night-time, when demand is low, wind power generators will even pay the grid manager to take their power (ie the dispatch price becomes negative)(see our post here). However, the retailer still pays the wind power generator the same guaranteed price under their PPA – irrespective of the dispatch price: in AGL’s case, $112 per MWh. At that price, retailers are paying more than 4 times the cost that they can purchase coal-fired power from Victoria’s Latrobe Valley (around $25 per MWh). SA imports a substantial part of its power needs from Victoria’s coal-fired plants – via the Murraylink and Heywood interconnectors – which have a combined capacity of 680MW. These power imports help cover the hundreds of occasions when SA’s wind power output collapses entirely for hours and days, on end. And it’s the fact that wind power can only be delivered at crazy, random intervals – if at all – that gives rise to the third reason why SA suffers the highest retail power prices in the world. The huge capital costs (requiring returns to investors) of having sufficient reserve capacity is one thing, but finding hundreds of MWs in a heartbeat means relying on “spinning reserve” held by coal or gas-steam plants (including CCGTs) and “peaking power”: fast start-up OCGTs (the reason why GE is right behind wind power – see our post here) and diesel generators. OCGTs cost $200-300 per MWh to run – depending on the dispatch price for gas; diesel generators cost over $450 per MWh in fuel alone. In Victoria, Origin energy built a 550MW, OCGT peaking plant just down the road from AGL’s Macarthur wind farm disaster (nameplate capacity of 420MW) aimed at cashing in at obscene rates ($12,500 per MWh, instead of the average of $35-40) when AGL’s fans down tools on a routine, but unpredictable basis (see our post here). Relying on peaking power to cover regular wind power output collapses comes at an ENORMOUS cost: the dispatch price that usually averages $40 per MWh quickly rockets towards – and often reaches – the mandated cap of $12,500 per MWh. Sure, this price gouging involves peaking power generators colluding, gaming and rorting the power market – but that’s just the inevitable result of SA (and now Victoria) trying to rely on a chaotic and wholly weather dependent power source. And – in the end – it’s South Australian and Victorian power consumers that pay dearly. South Australians have been left to wonder why SA’s economic future has been slammed into the basket case category by their political betters (see our post here). Now, as Victorians follow their lead into a dark and dismal future, they too can thank a political elite so bereft of even a modicum of common sense for setting them up for a life without power, and wonder how it all came about. Q: What did Victorians & South Australians use before candles? Hmm. One wonders if the Andrews Labor Govt will be the victim of selective deafness if their ‘enquiry’ comes up with findings they won’t want to hear. While there are thousands being cut off from energy supplies, there are probably still more who are connected but unable to live a normal life due to having to RATION their energy usage. Having to choose between food and heating/cooling. 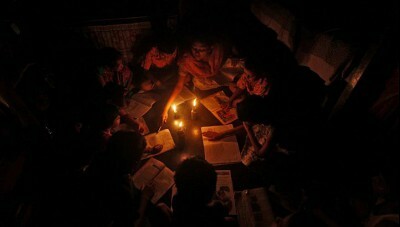 Having to use candles instead of electricity for light to read, reducing the temperature on their refrigerators. Maybe turning off their hot water service to reduce energy usage. What cost will these measures be to their mental and physical health, and ultimately what cost to the already stretched Medicare System? Saving the earth by destroying lives – what sense does that make? This is where the rubber hits the road. Our form of civilization requires CONSTANT AND DEPENDABLE ENERGY. People need it to power their computers. Without it, they enter the dark. They drop out of civilization. Remember barbarism? Cannibalism becomes likely. Already many, many have been thrown under the bus. For never having thought about the implications of Climategate and not being prepared for the Greatest Lie the world has ever been told; that the survival of the planet requires the conversion to renewable energy, at whatever cost! This is the mythology that will fulfill the neo-Malthusian dream that human activity is the nemesis of survival; humans are environmentally toxic. Some of those who subscribed to this tragic falsehood, like Robyn Willliams, who suffered from bi-polarism, have taken their own lives under this delusion. Make no mistake, the entirety of modern mind is the prize of these puppet-masters. If you read Tim Ball, PhD’s 2014 book; THE DELIBERATE CORRUPTION OF CLIMATE SCIENCE, you will immediately appreciate that these mind controllers began spinning their web back in the 1980’s, and now they hold a death grip on the world. Like a nightmare, it is possible to awaken from the sleep that, in this case, has captured our senses. Australia is where the dissolution of civilization is visibly taking place. ECO-fascism seems a rather mild term for the political-polemical state of affairs. Is one form of fascism better than another?